This is a new facility and very ecology conscious. You had to put your room key in a slot in order to turn on the lights. The hall was dark until activated by a motion sensor. If you need access to the Munich airport, this is an ideal location. The shuttle service is on a reservation basis and is efficient and timely. As expected for budget hotel. Small room with limited amenities. Everything was up to par here. The staff room and service were awesome. It was close to the airport; accommodating employees, easy access to shuttle and airport. Enjoyed the restaurant. Cute and charming hotel, where you can stay for a short visit. Easy check in, close to airport, a very decent shower. This is a great location for the airport. If you have a car it is easier than the shuttle. Easy access to the Autobahn from two directions so that is also good. Hotel is a short shuttle ride from Munich Airport and breakfast is available from 4 AM, very convenient for early morning flights. The personel at the reception was really helpful. They were happy to reschedule my airport shuttle when I had to change time and they provided me with a board and an iron. 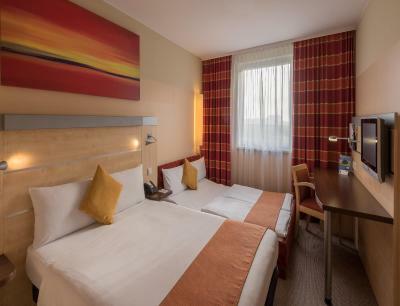 Holiday Inn Express Munich Airport This rating is a reflection of how the property compares to the industry standard when it comes to price, facilities and services available. It's based on a self-evaluation by the property. Use this rating to help choose your stay! The Neue Messe Exhibition Center is a 40-minute drive from the Holiday Inn. On-site parking is available. Wi-Fi internet is available and free of charge in all areas. Luggage storage is available. The business center includes free use of internet and a printer. 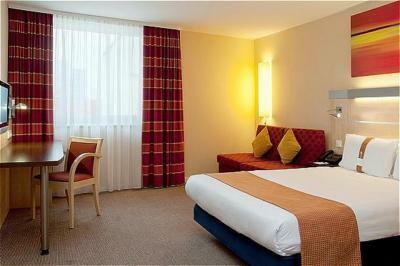 When would you like to stay at Holiday Inn Express Munich Airport? Air-conditioned room with hot drinks facilities and a flat-screen TV. Features particularly spacious rooms, and barrier free bathroom with massage shower. Air-conditioned room with hot drinks facilities and a flat-screen TV. Features an extra sofa bed and an elegant bathroom with massage shower. Air-conditioned room with hot drinks facilities and a flat-screen TV. Features 2 single beds and an elegant bathroom with shower. 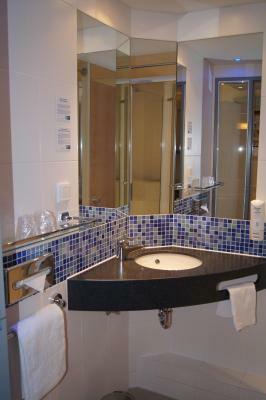 Standard, air-conditioned room features a flat-screen TV, hot drink facilities and a bathroom with shower. House Rules Holiday Inn Express Munich Airport takes special requests – add in the next step! Holiday Inn Express Munich Airport accepts these cards and reserves the right to temporarily hold an amount prior to arrival. The shuttle service is available from 04:35 until 23:49. It is free for guests up to 18 years when traveling with their parents, adults pay EUR 5. There is no stop in Terminal 1. Please note that the seats are limited. Guests can book a seat from the hotel to the airport 48 hours prior to arrival. It is not possible to book seats for the trip from the airport to the hotel. Pleasant staff, efficiently processed and a great price. The restaurant staff recommended a local sausage dish, which I wouldn't have ordered without his advice. Local, organic, simple. The front desk staff were really skilled - impressive linguists! Children's sofa bed was very uncomfortable, there was a big metal bar underneath half way down. The room was tight for space, especially for 2 large suitcases open. Clean, neat property with friendly, helpful staff and nice continental breakfast. We walked in and the couch was laid out as a bed so we had absolutely no room to stand. It was really uncomfortable. We couldn’t even get it to fold up, and the staff was super busy so we didn’t want to ask for someone to come in and fix it since we were only there to sleep and catch our flight the next day. This place is convenient because of how close it is to the airport. It met our needs in all areas. This was the worst mattress in a hotel so far. Everytime I or my wife moved the whole mattress was shaking. We barely slept.